The Nigerian military took us to towns taken back from Boko Haram in the north-east. Some are almost impossible to reach by road because the insurgents have blown up bridges. From one town to another, Boko Haram fighters have left their imprint of destruction - the charred remains of market places, homes, government buildings and farms. "Thank you! Thank you!" a group of women chant as they praise the soldiers who reclaimed their town, Doron Baga, from Boko Haram. It has been suggested that during the January attack, Boko Haram killed hundreds, possibly more - and then set fire to dozens of buildings. A group of women take shade under a tree away from the scorching heat. "Boko Haram fighters killed my sister," one tells me. "We attempted to leave three times for Maiduguri but the militants threatened to shoot us. They hardly fed us and we were very hungry. But when the soldiers liberated us, they gave us some food." Abubakar Ali is one of the few young men around. He had a fractured leg and could not run away when insurgents attacked Monguno town. "My grandmother hid me under the bed," he says. "They don't touch women, especially old women, but those bastards kill men. They came searching but they didn't find any man in the house so they left." 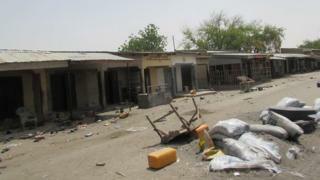 Even Mubi town, a major commercial centre in Adamawa State, is largely deserted, except for the troops on patrol. "I would plead with the people of Mubi," says the town's traditional Muslim leader, Emir Abubakar Ahmadu. "Come back home so that we develop Mubi more than ever before." With widespread destruction, the region is in need of massive rehabilitation - far more than what the residents can do on their own if they return. There are murmurings within the military that soldiers have been left to do the work other government agencies should be taking on. There is also the question of whether the people should return to restore a semblance of normality or whether they should remain displaced until the military completes its operations. There are regular reports of troops getting killed or maimed by mines planted by the insurgents. Boko Haram fighters are known to surround their locations with hidden bombs. Some soldiers showed me a stretch of about 20m (60ft) where they say they detected 29 improvised explosive devices. The army says such dirty tactics complicate the fight. This has not dampened the spirits of the troops. They have recorded major successes recently, reclaiming many of the towns taken by the militants. This has elicited as much praise as it has criticism over why it took so long to act. The military's gains were achieved in just a few weeks, while Boko Haram has been tormenting the region for the past six years. The successes also came when Chad, Niger and Cameroon joined in the fight against the Islamist insurgents. The subsequent plaudits these neighbours received proved embarrassing for Nigeria, the outshined regional powerhouse. Nigeria's military spokesman, Maj Gen Chris Olukolade, denied reports of tension between members of the anti-Boko Haram coalition. "Many of the opinions out there that seem not to be complimentary about participating colleagues are definitely not the positions of the countries," he said. "They are positions of individual officials. We don't expect it to affect the co-ordination within the force." At the Multinational Joint Task Force base in Baga near Lake Chad, only Nigerian troops are present. They seem motivated, regardless of the problems at the diplomatic level. The soldiers promise not to let Nigeria lose its territory under their watch. With new supplies of equipment, as well as fresh combat strategies from their superiors, morale is high on the frontline.